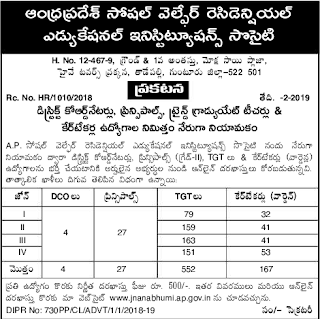 Applications are invited for appointment of DCO / Principal Grade-II / Trained Graduate Teacher / Caretaker(Warden) through direct recruitment in the Institutions run by APSWREI society in the State. A 1st class Post Graduate degree in the subjects shown at Annexure- C from any University recognized by UGC with not less than 60% marks in the relevant subject. The Applicants have to pay a fee of Rs.500/- towards Application processing fee for each post through Debit Card / Credit Card / On-line Transfer. On receipt of fee, the candidate shall be issued a Unique ID, which will act as reference number for the application. It may be noted that issuance of Unique ID does not mean that the candidate has submitted the application on-line. It is only a confirmation of the fee received.